RV water heaters are generally pretty reliable. Under normal conditions, they’ll last a good long while with very little attention. Failure to drain the water out of the tank before the first winter freeze would rank as the most common mistake. You can empty the water tank, drain everything else, but if you forget to take the drain plug out of the water heater it won’t drain. After the water freezes, the aluminum tank will split wide open. 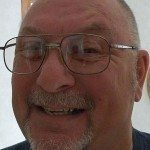 Another problematic time is the first time in the spring when you’re anxious to get going on that first RV trip of the season. If your water heater is equipped with a bypass kit (hoses and valves that stop water from entering the water heater) and you forget to open the valves allowing the tank to fill, you’re in trouble. If the burner is ignited and the water heater is empty of water, the temperature in the tank will rise to dangerous levels, possibly melting a hole in the tank. One final scenario would be corrosion inside the water heater. This can be caused by hard water. Over time, the water eats away at the aluminum tank and eventually it will develop a leak. This condition can be prevented by installing an anode rod. The corrosive reaction will eat away the anode rod and leave the tank alone.The anode rod is attached to a replacement drain plug, making installation as simple as removing the plug and screwing in the new plug/anode rod combination. Plus, every fall when you drain the tank, you will be able to see how well the anode rod has been working and determine whether the anode rod is still in usable condition or not. If it has dissolved away, you will know to buy a replacement one before the next time you use your RV. We’ve covered the most common failures of the RV water heater’s aluminum tank, now for the cure. The bad news is that replacing the aluminum tank portion of your RV’s water heater generally is a cost-effective procedure. By the time you order a tank, and have a technician completely dismantle the water heater, you’ll have as much money involved as what it would have cost you to just replace the water heater itself and start with a brand new one. 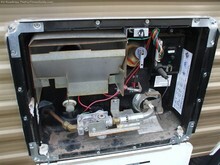 Your LP burner system and all controls will be new as well, guaranteeing a safe and well-functioning unit. By installing a new water heater you will gain a 2-year warranty that will be honored at all RV dealers. Providing you have sufficient space, this is an excellent opportunity to up grade to a larger capacity water heater, or go from manual to automatic controls. Removal of the damaged unit and installation of a new exact replacement is a relatively easy project. 1. Shut off the propane tanks; and remove the gas line accessible from the outside panel. 2. Disconnect any control wiring that may be involved with your specific model at the outside panel. 3. From the inside, disconnect the water lines attached to the water heater. 4. Remove the screws around the perimeter of the outside access door. These screws are what holds your water heater in place. 5. Slide the water heater out, then clean the old butyl putty tape from around the opening. Install a fresh layer of butyl putty tape and slide the new water heater in place. 6. Reinstall the perimeter screws. Tighten them — alternating from one side to the other to seat the water heater into the butyl putty evenly. 7. Next, reinstall the water lines being careful to hook them to the correct port. 8. Hook up the control wiring. 9. The last step: hook up the LP gas line. 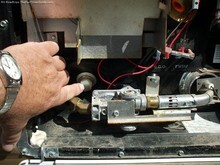 After you have installed the gas line, turn on the LP tank and spray the fittings with soapy water to check for leaks. Now you’re ready to turn on the water, making sure the water tank fills with water. After you have checked for water leaks and everything looks to be correct and ready to work, turn on the gas and light the water heater. Monitor the water heater’s operation as it heats the water the first time. After it has run a few minutes, turn on a hot water faucet and check that the water is warming up. If everything looks good, let it run a full cycle to make sure it shuts the burner down as it should. One final tip: If you remember to drain your water heater before the first freeze each winter, then you will most likely avoid this somewhat costly repair.